#imagine it was summer, and it was absolutely scorching hot. It was about 50 degrees outside! You were sat out in your back garden, fanning yourself with an American fan that the boys had brought home for you. You were best friends with the boys. You had been nearly all your life, you had been through everything with them. Suddenly, there was a knock on the door. 'Ugh,' you moaned, as you had to get up out of your chair to answer the door. You slowly walked over to the door, the heat was draining the energy out of you. You opened it, and there was Niall, Zayn, Harry, Liam and Louis. 'Hey! What are you guys doing here!?' you shouted. You were really happy to see them. You hadn't seen them in a couple of days, and you couldn't help but notice that they had bags with them. 'We were wondering if we could ask you a question?' Louis said. They were already in your apartment by this point and they'd put all their bags down on your dining table. 'Yeah, sure. What is it?' you asked, getting a little worried. They all walked over to the sofa and sat, down, so you just followed. But when they had all sat down on the sofa, there was no room left, so you just sat on the floor in front of them. 'Oh, you have me worried then! I thought it was going to be something really serious! Yeah! Of course you can stay here! You don't have to ask,' you said, getting really excited. You and the boys were out in the garden all day, just sitting on the deck chairs and talking. This is how you liked it. 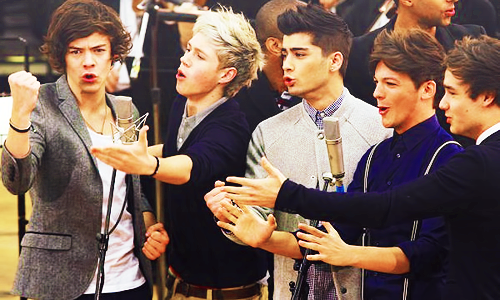 Just you, the boys, no-one else, it was perfect. The sun was starting to set now, but the temperature had still not changed. 'I can't believe how warm it is!' Niall said, who was now walking around in his underwear. 'I know, I've got an idea,' Louis said, running into your house. You looked at Harry and saw that he was staring at you, and he bit his lip. You and Harry had always had a bit of a spark, but you had never talked about it. He began to mouth something to you, but as he did Louis ran back out into the garden. He had a huge blanket bundled up in his arms. 'Whatcha got there?' you said, kneeling up on your chair. 'We could all sleep on your trampoline! It's warm enough! We could all sleep outside,' Louis said, climbing up onto the trampoline. You all followed him and sat there for a while. The sky got darker and darker, but the heat was still intense. You were getting tired, and you yawned. 'You getting tired?' Harry said, laying down next to you. 'Just a little bit,' you whispered, cuddling into his chest. You suddenly began to feel different. It was just Harry, why did this feel so right? As the night went on, the conversation died down, and you were still in Harry's arms. You just laid there, wide awake, feeling Harry's breath in your hair. Everyone else was asleep, you could hear them all snoring, well, all of them except for Harry. You slowly tilted your head up, just in case he was asleep. You didn't want to wake him. But he was awake, looking at you with his pretty green eyes. It was getting colder now, as the night went on the temperature began to drop. You got a shiver up your back, and Harry pulled you closer in to him. It made it so much better, it made you warmer. 'I love you so much,' he whispered into your hair, breathing deeply. 'What?' you said, sitting up. 'Harry, I love you,' you whispered, into his ear and then began to kiss him again. You layed back down on the trampoline, with the blanket wrapped around both of you. It had never felt more right. You woke up the next morning to the loud chirping of birds, and you were still wrapped tightly in Harry's arms. Everyone was still fast asleep, so you just layed there, taking advantage of every second you got to lay in Harry's arms. The temperature was still high, but it wasn't as bad as yesterday's. Suddenly, you heard Niall yawn. '1, 2, 3....' you heard Niall whisper. Suddenly you got an awful stench that wafted past your nostrils. 'Oh my god! Nialler that stinks!' you screamed, waking everyone up. Everyone started complaining about the smell, but you and Harry still stayed tangled in each other. 'Hey! Did you finally tell her?' Louis said, looking at you and Harry. 'Yeah, I did,' Harry said, looking down into your eyes. He kissed the top of your head, and you snuggled back into his chest. All the boys started whooping and cheering, you had never been more happy in your life. You had everything you ever needed with you on this trampoline. Your friends, Harry. That's all you ever needed.